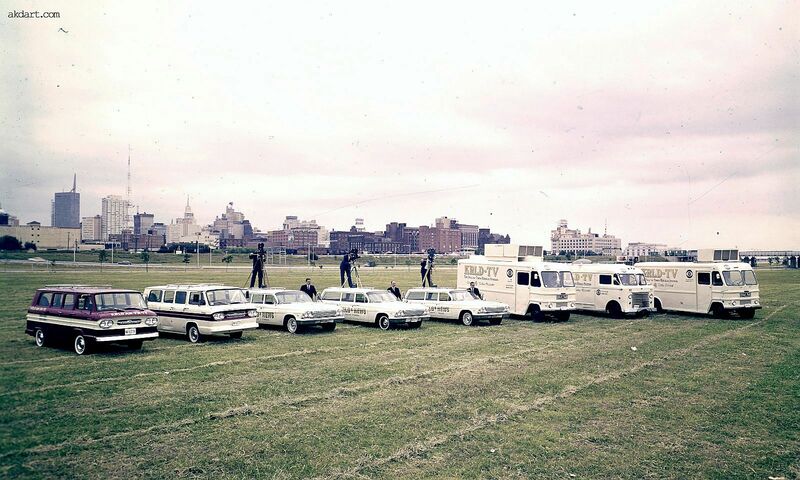 Early-’60s-era KRLD radio and TV mobile news crews are seen above, showing off their fleet and ready for breaking news. Behind them, the Dallas skyline, seen from an unusual vantage point: the Trinity levees. See this photo really big here, and explore the skyline, from the Republic Bank Tower on the northern edge of downtown, to the Dallas Morning News building on the southern edge. Photo is from an interesting collection of “very old pictures from KRLD radio and TV,” presented on the website akdart.com. And I’ll add a definite year for the picture: 1963. The three station wagons are 1962 Chevrolet Impalas, and all the vehicles are sporting black-on-white license plates with two-letter-four-digit numbers. The only years that combination was used were 1961 and 1963, and the 1962 model cars rule out 1961.
know much about 1959 Nash Rambler station wagons in the area at that time…? I wonder if they noticed that the WFAA tower and the Dallas Morning News building are in their picture. I guess that was before Photoshop. I don’t know, it might just show that they’re out in front of their competition. The infamous Texas School Book Depository is at the center. But look at the left edge. There’s a light-colored building with a brown stripe at the top that appears to say TEXAS SCHOOL BOOK DEPOSITORY. Yes, “Texas School Book Depository” is on the outside of the building.